By default, Chimera preferences are stored in the file $HOME/.chimera/preferences, where $HOME refers to the user's home directory (on Windows, this depends on a user's profile but is often C:\Documents and Settings\username\Application Data\). The location can be changed in the Preferences section of the Preferences Tool. The file contains information besides preferences, such as the names of recently accessed files and directories. At startup, Chimera will look for a file named preferences first in the current directory, then in a .chimera subdirectory of the current directory, then in the .chimera subdirectory of the user's home directory (the default location). The initial setting in the Preferences section of the Preferences Tool will match where the file is first found, or if none is found, the default location. For just the category being shown: Reset replaces the current settings with the original defaults, Restore replaces the current settings with those previously saved in the preferences file, and Save saves the current settings to the preferences file. Equivalent operations can be performed for all categories at once in the Preferences section of the Preferences Tool. Help opens this manual page in a browser window, and Close dismisses the Preferences Tool. Default settings are indicated below in bold. The Collaboratory section of the Preferences Tool controls some aspects of the Collaboratory extension. Setting a port number and publishing the IP address may help enable use under certain problematic network conditions. Show atomspec balloon (true/false) - whether to show information in a balloon when the cursor is left over an atom or bond in the graphics window. The number of decimal places shown for bond distances can be set with the Distances tool. Open dialog starts in directory from last session (true/false) - whether the first open/save dialog invoked during a session should start in the directory where a file was last opened or saved in the previous session, or in the current working directory. The default is true on Windows systems, false on the others. The Image Credits section of the Preferences Tool specifies information to be included in saved image files (TIFF, PNG). This information does not affect the image itself. The Image Setup section of the Preferences Tool sets specifications for images saved to files using the Image Panel. This section can also be invoked from the Image Panel. The Messages section of the Preferences Tool controls the disposition of command, status, warning, and error messages. The Midas section of the Preferences Tool is only available when the Command Line (Midas Emulator) is shown. and either or both are executed (in the order listed), if found. The defaults can be deleted and/or additional names and locations can be added to the list. The files are treated as if they had been sourced in the Command Line. Whether files are listed by name followed by path or with the path preceding the name is controlled in the General preferences. The midasrc mechanism is similar to that in MidasPlus, where a file named .midasrc in the user's home directory was automatically executed upon program startup. In general, the same file can be used in Chimera after minor adjustments. The differences in atom specification mainly reflect additions, but note that in Chimera, chain IDs are specified differently and mainchain is not accepted as a specifier. A few Midas/MidasPlus commands are unsupported by Chimera. By default, structures are rotated with the left mouse button and XY-translated with the middle mouse button (for more details, see mouse manipulation). 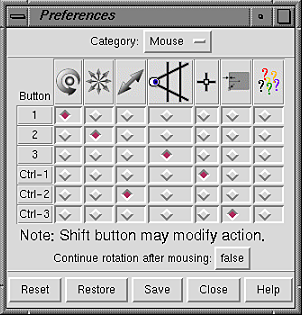 Mouse button functions can be reassigned within the Mouse section of the Preferences Tool. This panel may be used to assign functions to the left, middle, and right mouse buttons (Buttons 1, 2, and 3, respectively). Ctrl-1, Ctrl-2, and Ctrl-3 indicate the functions of the left, middle, and right mouse buttons when the Ctrl key is also held down. Current assignments are indicated by color-highlighted checkboxes. Since a button can only have one function, selecting a function by mouseclick turns off the previously selected function in that row. The figure shows the default assignments. Going from left to right, the symbols across the top of the panel signify rotation, XY-translation, Z-translation, scaling, atom and bond picking (selection), lens control, and a pop-up menu bar when the standard menu bar is not visible (not implemented). Continue rotation after mousing (true/false) indicates whether to rotate continuously when the mouse button assigned to rotation is released while the cursor is in motion. use new color for each model (true/false) - set the model-level color (see coloring hierarchy) differently for each new molecule model; submodels with the same main model number will be assigned the same model-level color. This preference can also be controlled with set/~set autocolor. ribbon display (off/on) - whether to show a secondary structure ribbon; ribbons are only drawn for proteins and nucleic acids. Protein helix and strand assignments are taken from the input structure file or generated with ksdssp. stick scale (1.0 by default) - scale factor for bonds in the stick draw mode. The stick scale is multiplied by individual bond radii (default 0.2 angstroms) to generate stick radii in angstroms. Changing stick scale is preferable to changing all of the bond radii in a model, because the former will also scale singleton atoms in the endcap draw mode appropriately. Either way, the other endcap atoms (those participating in bonds) will be scaled to match the thickest of the attached bonds. ball scale (0.25 by default) - scale factor for atoms in the ball draw mode. The ball scale is multiplied by individual atom VDW radii to generate ball radii in angstroms. Preferences file - location of the preferences file for the current session. The initial setting will match where the file is found at startup. The Locations section allows users to specify additional directories for Chimera to look in for tools. Clicking Add opens a dialog for directory specification. Delete removes a directory from the list. Confirm open of commands or code (once per session/each time/never) - whether/how often to ask for confirmation before opening certain types of data linked to web pages. The default is to ask once per Chimera startup. Accept web data (true/false) - whether the running instance of Chimera can be used as a helper application for data linked to web pages (and can receive files specified with chimera --send). On Mac OS X, this preference is not shown, and is effectively always true. After a browser has been configured to send Chimera certain types of files, setting Accept web data to true enables the running instance of Chimera to accept such files. If there is no running instance of Chimera enabled to accept web data, another instance of Chimera will be started and used to open the data. If there are multiple running instances of Chimera set to accept web data, the file will be sent to the instance that most recently had focus (was most recently clicked into).